Five years ago, Steven Berry could not even walk, let alone dance. “Every time I put my foot on the ground, it hurt so much I could hardly stand it,” says the Buncombe, Ill. resident. After undergoing a total knee replacement at Saint Francis Medical Center in 2010, Berry is lighter on his toes than ever. 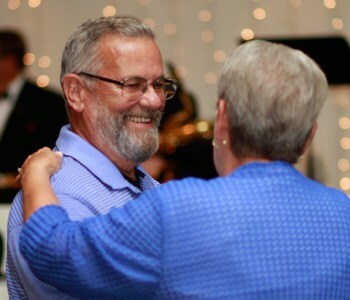 At the Center for Joint Replacement and Revision’s annual dance June 5, Berry, now 70, was among the most active people on the floor. After his surgery, Berry was so pleased with his experience he told anyone who would listen, including his neighbor, who underwent a total knee replacement at Saint Francis just a couple of months later. Berry says he appreciates how the staff personalized the experience to him and treated him like a well person who just needed to get back on his feet. “I was more than just another surgery patient, I became part of their family. Saint Francis made me who I am today and if I had to do it again, I would be back there in a minute,” he says.